Looking for a flexible, kid-friendly side dish? This low FODMAP coleslaw is a FODMAP-friendly twist on this classic dish. With a fresh taste and a bold colour, it’s the perfect sidekick for your next big bash! 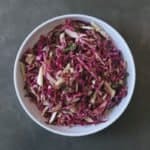 Try out this low FODMAP coleslaw at your next family picnic, on smoked meats and sausages, or as a fresh and crunchy summer salad. Then, bring it inside during the colder months. The light, creamy taste is extremely versatile. And, the pop of colour looks phenomenal on a winter themed table. As a side note, my husband’s family is Estonian and sauerkraut is a traditional holiday food, there. 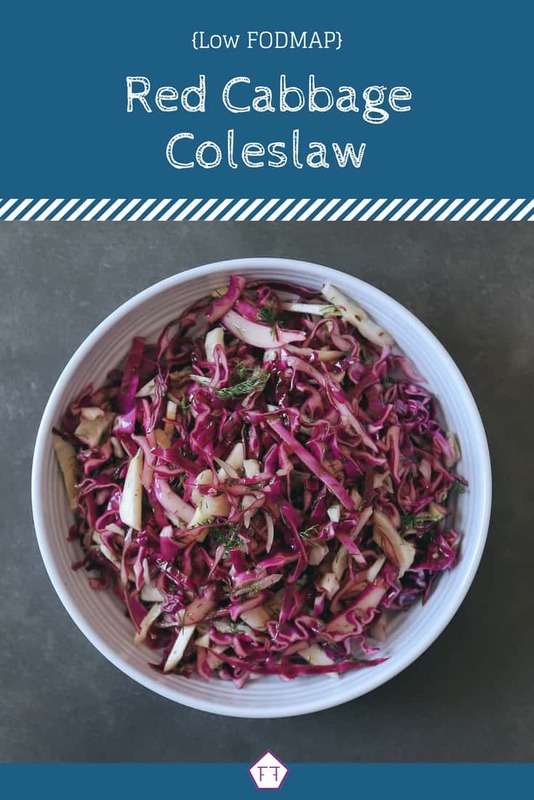 If you also have sauerkraut as part of your holiday tradition, this coleslaw would be a great alternative during the elimination phase. According to Monash University, sauerkraut is high FODMAP, and may not be suitable for all people with IBS. You can read more about their findings here. Think this low FODMAP coleslaw sounds great, but you don’t have time to try it now? Don’t worry! You can PIN THIS POST for later. Add a little colour to your summer with this light and creamy low FODMAP coleslaw. Check out the notes below for tips on keeping this recipe FODMAP friendly. First, this low FODMAP coleslaw gets its bite from lightly toasted caraway seeds. According to Monash University, caraway seeds are low FODMAP in servings of 2 tsp per serving. Servings of 1 tbsp or more are high in galactooligosaccharides. Our recipe uses 1.5 tsp, which works out to 0.19 tsp per serving. This is well within the recommended range. Next up, apple cider vinegar. Monash recommends limiting apple cider vinegar to 2 tbsp per serving though, they don’t show maximum serving. This low FODMAP coleslaw uses 2 tbsp in total, which works out to 0.25 tbsp per serving. This is well within the recommended range. For an extra citrus punch, we’ll also be using fresh lemon juice and lemon zest. According to the Monash app, lemon juice is safe in servings up to 1/2 a cup. We’re only using 2 tbsp for the whole recipe, so we’ll be fine there. Just so you know, Monash currently doesn’t have lemon zest listed in the app. However, there are two recipes on the Monash University blog that use lemon juice and lemon zest in a similar amount per serving. If you’re not sure if that will work for you, skip the lemon zest. Next up is Dijon mustard. According to Monash, Dijon mustard is safe in servings of 1 tbsp per sitting. Just so you know, servings of 3/4 cups or more are high in both fructose and galactooligosaccharides. We’ll also be using fresh red cabbage. Monash says red cabbage is safe in servings of 3/4 cups per sitting. Servings of 1.5 cups or more are high in both fructose and galactooligosaccharides, so don’t go crazy. Our recipe uses 3 cups of red cabbage, total. This works out to a 1/2 cup of cabbage per serving. This is well within the recommended range. Keep in mind, depending on how you use this recipe, you may not use a full serving. Because our cabbage space is somewhat limited, we’ll add some fresh fennel to add some bulk and change up the colours. According to the Monash app, fennel bulbs are safe in servings of 1/2 a cup. Servings of more than 1/2 a cup are high in the polyol mannitol, so measure carefully. 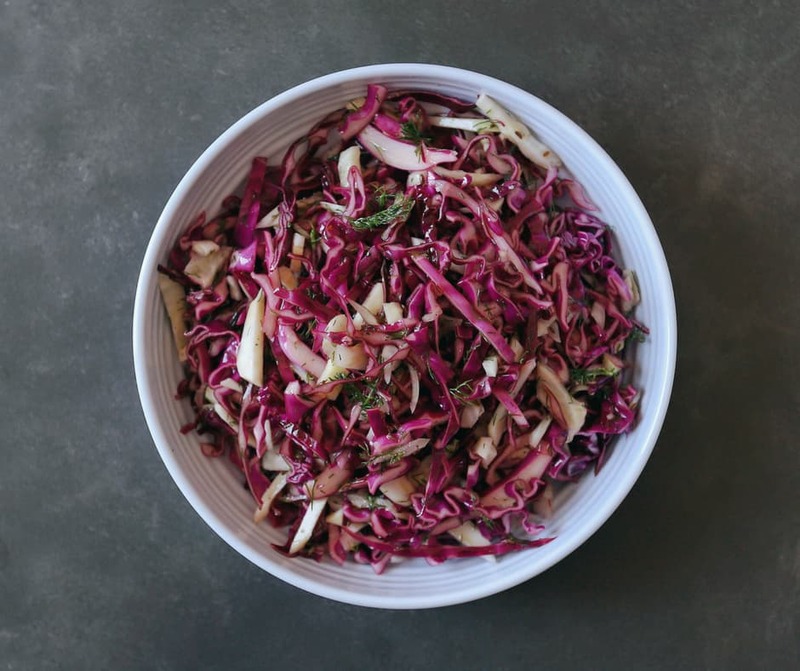 For this low FODMAP coleslaw, we’ll be using 1 cup of fresh fennel bulb for the entire recipe. This works out to 1/8 cup of fennel per serving. This is well within Monash’s recommended range. Our last ingredient is fresh dill. According to Monash, fresh dill is safe in servings up to an entire bunch (175 g). We only use 1/4 cup, which is well within the recommended range. This low FODMAP Coleslaw is really versatile, so feel free to be creative when you try it. I highly recommend you try it on these low FODMAP hamburgers or on a low FODMAP sausage. But, you can also try it in sandwiches like a Reuben, kielbasa, grilled cheese sandwich, or on this classic low FODMAP pulled pork sandwich. Want to try this low FODMAP coleslaw? Don’t forget to PIN THIS POST for later! Add some colour to your summer with this low FODMAP coleslaw. This quick and easy side dish is the perfect sidekick for your next backyard bash. Heat up the olive oil in a small non-stick pan and toast the caraway seeds for 1 minute, stirring frequently. Then, scrape the seeds and oil into a large heat-proof bowl to cool. Whisk in the garlic-infused oil, vinegar, lemon juice, and mustard. Then, add the cabbage, dill, and salt. Toss gently to coat in dressing. Looking for a kid-friendly side dish for your next backyard bash? This quick and easy low FODMAP coleslaw is the perfect sidekick for your summer. If you like this recipe, don’t forget to share it. Together we’ll get the Low FODMAP Diet down to a science! Low FODMAP Potato Wedges: Looking for an easy, kid-friendly side dish? Try these low FODMAP potato wedges. Made in the oven, these crispy wedges are the perfect side dish for your BBQ adventures. Low FODMAP Quinoa Salad: This quinoa salad is packed with fresh ingredients. Enjoy it as a healthy lunch on the go or as a quick and easy side dish. Low FODMAP Caprese Sticks: These caprese sticks are a quick and easy way to add a pop of colour to any table. Use them as a finger-friendly appetizer, a fresh side dish, or a healthy snack.